The winner of CAMRA’s Champion Beer of Britain 2017 has just been announced. 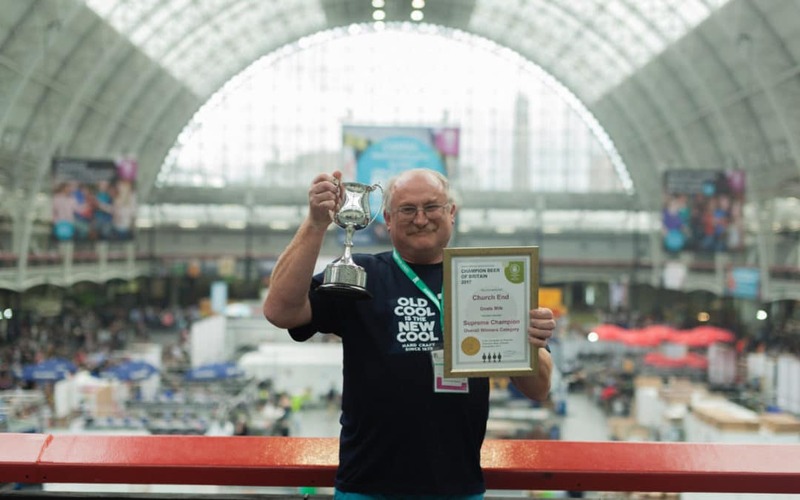 Goats Milk, brewed by Church End Brewery, has taken the top gong at the Great British Beer Festival. The Warwickshire brewery, originally located in an old coffin shop, has won on the opening day of the Great British Beer Festival at Olympia London. Goat’s Milk by Church End scooped gold in the competition thanks to its blend of pale barley, crystal malt oats and aromatic hops. The award comes after almost a year of local tasting panels and regional heats resulting in the best beers from across the UK being invited to compete at the Great British Beer Festival. Final judging for the competition was held at the beer festival which opened its doors to the public on 8 August and will see more than 50,000 people visit to sample from more than 900 beers, ciders, perries and fine wines – including the chance to try the nation’s best beer. Bishop Nick from Essex took silver with Ridley’s Rite, a pale ale with a floral aroma and satisfying bitterness, while Welsh brewery Tiny Rebel – former Champion Beer of Britain winner – won bronze with Cwtch, a red ale with a blend of six caramelly malts and three citrussy American hops.